Final possessions don't get more predictable. 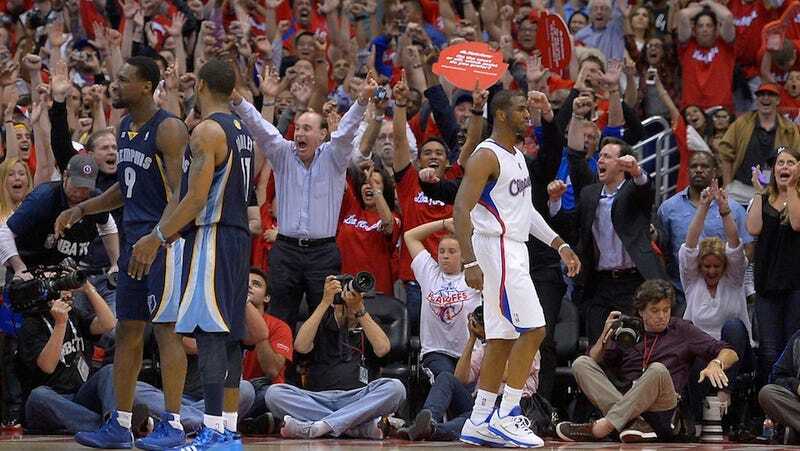 In a tie game with 13 seconds left and Clippers ball, Chris Paul was going to take the last shot. Tony Allen was going to be the one tasked with denying him. Paul's and Allen's faces in this photo, taken one second post-swish, tells the story. This is why Los Angeles paid a premium for Paul a season-and-a-half ago. The team-leading 24 points and nine assists, as the Clips take a 2-0 series lead. The fact that no one not named Chris Paul scored a point for the Clippers over the game's last 6:52, holding the fort as the Grizzlies stormed back from a double-digit fourth quarter deficit (he had the team's final eight.) The game-winner, against one of the NBA's best defenders. Tony Allen was beside himself in the locker room afterwards. He wanted to send Paul left, to his weaker side. He wanted to get help from Mike Conley, on Jamal Crawford in the corner, or Darrell Arthur on Blake Griffin down low. Paul went right. He thew up a floater from the circumcenter of the three defenders. Glass and in. That's what Chris Paul gives you. The best player on the court against all but a handful of other teams. That's enough to win a division, to take over the offense down the stretch in a playoff game, to take and make the last shot. Enough to take a commanding series lead over one of the league's best defensive teams. It was all so predictable.